Fresh lobster is the last thing we ever expected to harvest from our property. Tuesday night’s flash flood of rain must have washed more than just water through our drainage ditches. Okay, it’s not a lobster. Research suggests it is likely a Red Swamp Crayfish. Cyndie and Delilah happened upon this large surprise while walking along our pasture fence line. When Delilah challenged the strange creature, it snapped its claws at her. 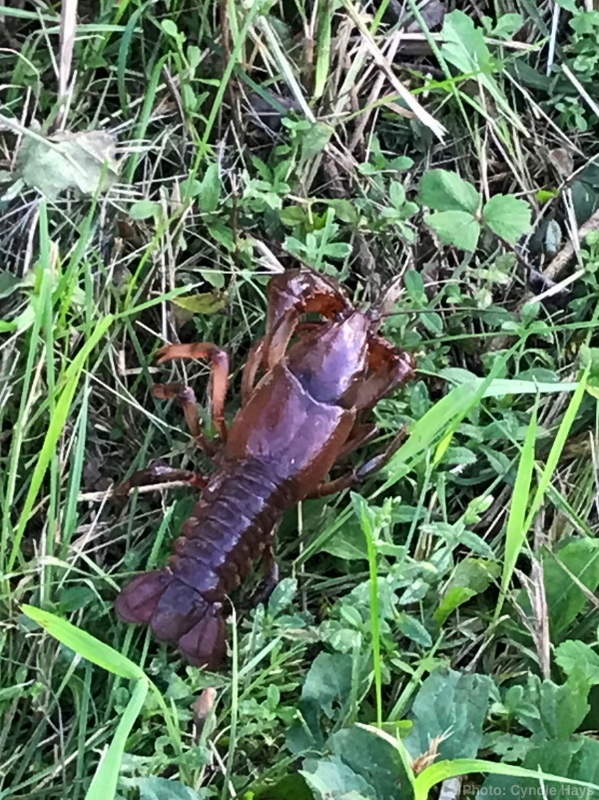 This critter was big enough that it looked a lot more like what we normally see as lobster than it did the small crayfish we are familiar with in local lakes. Cyndie watched it climb along in the grass, wondering where it could have come from, and where it might be trying to go next. There aren’t really any water bodies nearby that we associate with crayfish habitat. The ditch it was closest to certainly moves the most water around here after a storm, but for the majority of time throughout the year, it remains a dry bed. I wonder if it would have found favor in our landscape pond. Cyndie wasn’t interested in picking it up, so I guess we’ll likely never know. Much larger than any of the crawfish in my creek. None of them would present any sort of challenge to the dogs. This thing would have fooled most people if served as a lobster dinner!